Music is known to stir up emotions. 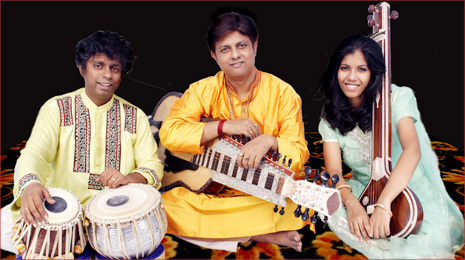 Indian raga music has always emoted through the unique juxtaposition of notes and rhythm. Songs of seasons, of romantic yearning, pining love and separation, songs of Indian deities, form a large part of the musical repertoire. Amongst the myriad of emotions on display, portrayed by vocalists and instrumentalists alike, the one that pervades them all is the ability of music to move and sway, such that one wants to lose oneself in its sublimity. It has the power to intoxicate. Debashish Bhattacharya is a long-standing maestro of this art. His compelling style has long carried the listener into a sonic journey where a mood is set at the immediate pluck of a string and slide of a note. Along with the April release of Beyond the Ragasphere an world music albm upbeat album featuring GALAXI of Star artistes around the world and an August US release of Traditional Raga Album Madeira Debashishis bringing varieties of soundscapes Music collaborations with American Virtuosos like Adam Del Monte-Flamenco Guitar, Jeff Sipe-Drums, Alana Rocklin- Electric Bass, Fima Ephron-Bass guitar and Subhasis Bhattacharjee-Tabla as well as Anandi Bhattacharya-Singer. Music from INDIA and UNITED STATES of AMERICA will create a timeless blend,an updated message will be spread of Peace and Joy. Jeff Sipe, Adam Del Monte , Fima Ephron. Jeff Sipe, Adam Del Monte, Alana Rocklin. Debashish Bhattacharya will be teaching Hindustani Rrag music, slide guitar style and technic in California from 13th October to 24th October 2013. 4640 Phebe Avenue, Fremont, CA-94555.